1 LISBP; UMR INSA-CNRS 5504 & INRA 792; Toulouse, France. 2 Fundación Alfonso Martín Escudero; Madrid, Spain. 3 Institut de Mathématiques de Toulouse, 118 route de Narbonne, F-31062 Toulouse, France. 4 Toulouse White Biotechnology Center, UMS INSA-INRA-CNRS, F-31520 Ramonville. Keywords: TPS1, trehalose 6-phosphate, glycolysis, flux sensing, Crabtree effect, glucose repression, Saccharomyces cerevisiae. The yeast Saccharomyces cerevisiae is widely used as a eukaryotic model organism for fundamental research. In addition, it is the most utilized microorganism in traditional biotechnological applications such as bread-making and fermented drinks , and deserves a great desirability towards the exploitation of renewable carbon sources for fuels and commodity chemicals . These applications often involve rational design of the carbon metabolic pathways to increase performance and robustness, quantitatively expressed as production titer, yield and productivity. This metabolic rewiring requires at first glance an extremely well detailed knowledge of the metabolic networks and their regulation. Glycolysis is the backbone of the carbon metabolism in S. cerevisiae and even after more than 50 years of intensive research , the regulation of this pathway is not completely understood. A still unsolved issue concerns the role of the trehalose-6-phosphate synthase (TPS) complex in carbon and energy metabolism of the yeast S. cerevisiae. This complex contains four subunits, namely Tps1, Tps2, Tps3 and Tsl1. The subunit encoded by TPS1 catalyzes the formation of trehalose-6-phosphate (T6P) from glucose-6-phosphate (G6P) and UDP-glucose. T6P is then dephosphorylated by the subunit encoded by TPS2. Subunits encoded by TPS3 and TSL1 do not harbor any known catalytic function but may participate in the integrity of the TPS complex . The deletion of TPS1, not only prevents the synthesis of trehalose, an α-D-glucopyranosyl-(1-> 1)-a-D-glucopyranoside, that serves both as storage carbohydrate and stress protectant in yeast , but most importantly, it leads to a growth defect on fermentable sugars . This defect is witnessed by a massive accumulation of sugar phosphates and depletion of ATP upon addition of rapidly assimilated sugars to nutrient-starved yeast or yeast cultivated on non-fermentative carbon sources . Two models have been proposed to account for this glycolytic defect phenotype, namely an over-activity of the major yeast hexokinase encoded by HXK2 due to the loss of its inhibition by T6P , and a depletion of intracellular Pi due to hyper-accumulation of sugar phosphates leading to an inactive glyceraldehyde-3-P dehydrogenase . More recently, van Heerden et al  revisited these two models through the combination of flux analysis using 13C labelling experiments and mathematical modelling. They concluded about the importance of Pi-dynamic in the startup of glycolysis, which can be brought about by an ATP hydrolysis, resulting from trehalose metabolic cycling. Nonetheless, this last model does not consider that a mutant defective in TPS2 does not exhibit any apparent glycolytic defects, except a very high accumulation of T6P . In addition, besides this glycolytic defect, a yeast mutant defective in TPS1 exhibits other multiple and apparently unrelated physiological defects, such as hyper-accumulation of glycogen , sporulation deficiency , higher uncoupling of the respiratory chain , reduced phospholipid production , lack of gluconeogenesis repression , as well as a high sensitivity to temperature and oxidative stress . Altogether, these results underline a wider role of Tps1 in the regulation of S. cerevisiae metabolism. To further document on the importance of the Tps1 protein and its product T6P in yeast sugar metabolism, we decided to revisit previous works dealing with complementation studies of a S. cerevisiae tps1Δ mutant (Sctps1Δ) with TPS1 homologues from different origins, including bacteria, fungi, plants and insects. This work was motivated by the fact that these complementation studies were merely qualitative, employing episomic plasmids in which TPS1 homologues were cloned either under their own promoter or under ADH1 or PGK1 promoter. Also, these complementation assays were carried out with tps1 mutants from different strain backgrounds , which hampered any comparison between the data. In addition, a recent result of our group showed that S. cerevisiae tps1Δ mutant recovered growth on glucose after transformation with the Yarrowia lipolytica TPS1 (YlTPS1) cloned in an episomic plasmid under the PGK1 promoter, even though T6P was barely detectable . Conversely, Bonini et al. reported a partial glucose growth recovery of a Sctps1Δ upon expression of the E. coli otsA cloned in an episomic plasmid under PGK1 promoter while levels of T6P were almost comparable to those in wild type yeast. Therefore, in order to seek further on the role of Tps1 and T6P in yeast sugar fermentation, we compared the potency of various TPS1 homologues to quantitatively complement phenotypic traits of a tps1Δ mutant made in the physiologically well characterized CEN.PK strain . This comparative study was carried out by expressing these homologous genes on the same centromeric vector under a constitutive PGK1 promoter, instead of the TPS1 promoter, to avoid unpredicted transcriptional control of this gene. This work led us to propose that the Tps1 protein is indispensable for growth on a fermentable carbon source, whereas T6P may act as a sensing molecule promoting fermentation and glucose repression. Based on a phylogenetic analysis of the TPS proteins reported earlier by Avonce et al , we selected TPS1 genes that belong to the main branches of the tree topologies, and combined this selection with previous works reporting complementation of the Sctps1Δ mutant by the selected genes. Accordingly, we performed a new phylogenetic analysis with the retained 14 TPS proteins. This analysis grouped these proteins into 3 subgroups (Fig. 1). In the first group are TPS proteins from the yeast species including S. cerevisiae, K. lactis, Candida albicans, Hansenula polymorpha and Pichia pastoris. A second subgroup comprises TPS from the yeast Schizosaccharomyces pombe and the two filamentous fungi Aspergillus nidulans and Magnaporthe grisea. The position of TPS from Yarrowia lipolytica is somehow in forefront of these two subgroups. The TPS protein from the bacteria E. coli and R. solanacearum composed the third distinct subgroup, which also contains the protein from the insect D. melanogaster. The TPS protein from the plant A. thaliana encoded by TPS1 linked in between the second and the third subgroup. Comparison of amino acids sequence alignment of these TPS proteins confirmed that they all harbored the residues involved in the binding of the substrates G6P and UDPGlc (see Fig. S1). This alignment also revealed an N-terminal extension of the A. thaliana TPS protein which is also present in the Rip protein of R. solanacearum (Fig. S2). It was shown that this N-terminal extension has an inhibitory effect on the catalytic activity of the TPS protein . This alignment also underscores an important C-terminal extension of more than 300 amino acids length for the TPS protein of A. thaliana, P. pastoris and D. melanogaster. FIGURE 1: Phylogenetic tree of TPS protein homo-logues. Phylogenetic tree calculation is based on a sequence distance method and utilizes the Neighbour Join-ing algorithm of Saitou and Nei . To investigate the ability of TPS1 homologues from bacteria, fungi, plants and insects to complement phenotypes of S. cerevisiae tps1Δ strain (Sctps1Δ), we cloned their CDS (coding sequence) in the centromeric YCplac33 plasmid under the ScPGK1 promoter. As shown in Fig. 2, all the TPS1 homologous genes could complement the glucose-negative phenotype of a Sctps1Δ mutant on solid media although with different efficiency. Indeed, the potency for growth recovery was lower with the plant, insect and E. coli TPS1 homologous genes than with yeast and filamentous fungi counterparts, and was only perceptible with the two R. solanacearum TPS1 homologous genes, namely otsA and rip1. The weak capacity of these TPS1 homologues to complement the growth defect of Sctps1Δ could not be ascribed to a lack of gene expression, since transcripts of these genes were between 1 to 2,5-fold higher than that of the endogenous TPS1 in the wild type as determined by RT-qPCR (Fig. S3). It could be noticed that the transcription of TPS1 homologues from E. coli, A. thaliana and D. melanogaster was among the highest, in spite of a weaker capacity of these genes to complement the glucose growth defect of a Sctps1Δ. FIGURE 2: Growth assay of S. cerevisiae tps1Δ mutant transformed with TPS1 from different organisms on solid media. The Sctps1Δ strain transformed with YcpLac33 plasmid bearing TPS1 homologue was cultivated on YN trehalose 1 % till 5 OD600 units. 10 μl of serial dilution from this preculture was spot-ted on YN agar plate containing glucose or galactose at 2% (w/v). Growth was scored after 2 days at 30°C. We next measured the growth rate of Sctps1Δ transformed with the different TPS1 homologues on different carbon sources. To this end, all yeast transformants were pre-cultured in the permissive YN medium containing 1% trehalose. As reported earlier, this culture condition mimicked a steady-state glucose limited continuous culture at low dilution rate which favors full respiration  and can be quickly switched into a respiro-fermentative mode by addition of excess glucose . When the cultures reached around 5 units OD600, they were diluted 50-fold in 0.35 ml of YN medium containing glucose (Fig. 3) or fructose (Fig. 4). This experiment clearly showed that TPS1 homologues do not equally restore growth of the Sctps1Δ mutant on these fermentable sugars. With the exception of the P. pastoris TPS1, the TPS1 homologues of the yeast species were as efficient as the S. cerevisiae gene to reestablish growth rate of the Sctps1Δ mutant on these sugars. In contrast, the resumption of growth was retarded in tps1Δ expressing TPS1 homologues from the filamentous fungi A. nidulans and M. grisea. This delay in growth resumption was even more exacerbated upon expression of the E. coli, A. thaliana or D. melanogaster TPS1 homologue, with the extreme situation of Sctps1Δ expressing R. solanacearum otsA that only started to grow after 15 h. Likewise, expression of Rsrip1, the other TPS1 homologue of this bacterium , as well as the tps1-156 allele, encoding for a catalytically dead Tps1 , failed to recover growth of Sctps1Δ after two days of cultivation in glucose or fructose containing YN medium (data not shown). 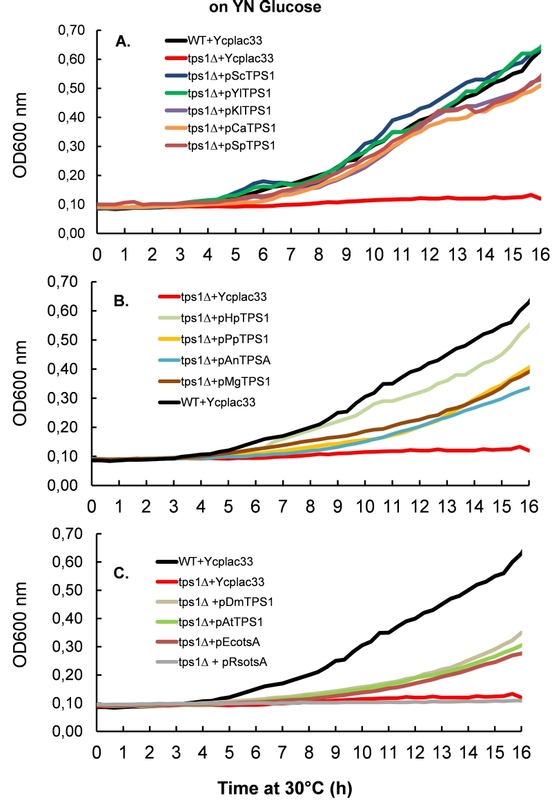 Notwithstanding, the difference in the capacity to resume growth on fermentable sugars, we verified whether Sctps1Δ transformed with the different TPS1 homologous genes exhibited also difference in their maximal growth rate (μmax). 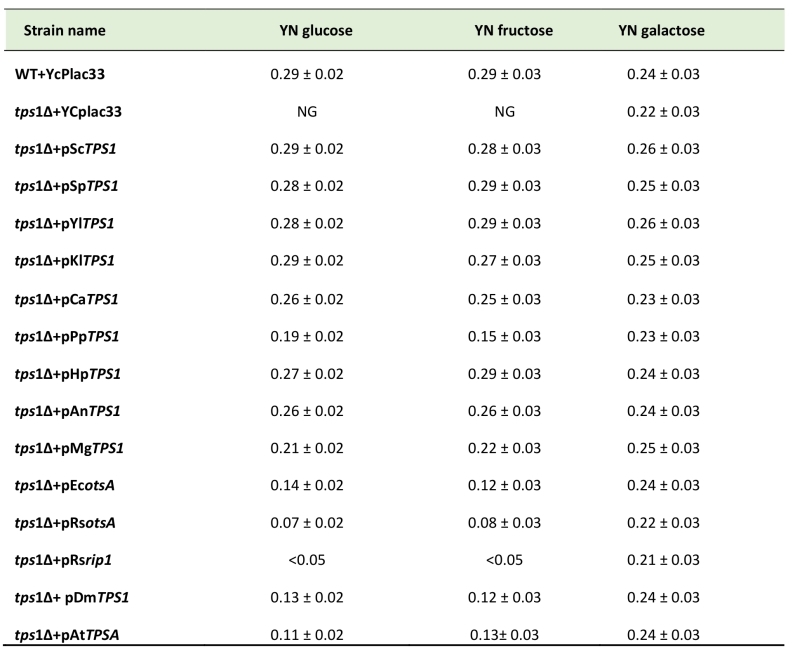 As reported in Table 1, we found similar μmax on glucose and fructose as wild type of Sctps1Δ complemented with yeast and filamentous fungi TPS1, with the exception of the P. pastoris and M. grisea gene for which the growth rate was 25-35% lower than that of wild type. Also, the maximal growth rate was more than two fold lower in Sctps1Δ transformed with the TPS1 homologue from E. coli, A. thaliana and D. melanogaster. 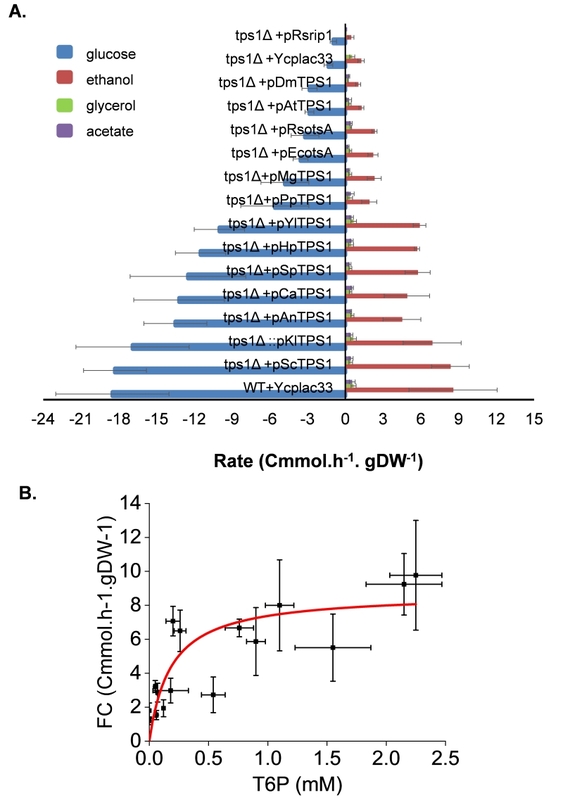 A generation time of > 10 h was estimated for the Sctps1Δ expressing RsotsA, whereas there was no significant growth of the Sctps1Δ mutant bearing Rsrip1 on glucose or fructose. 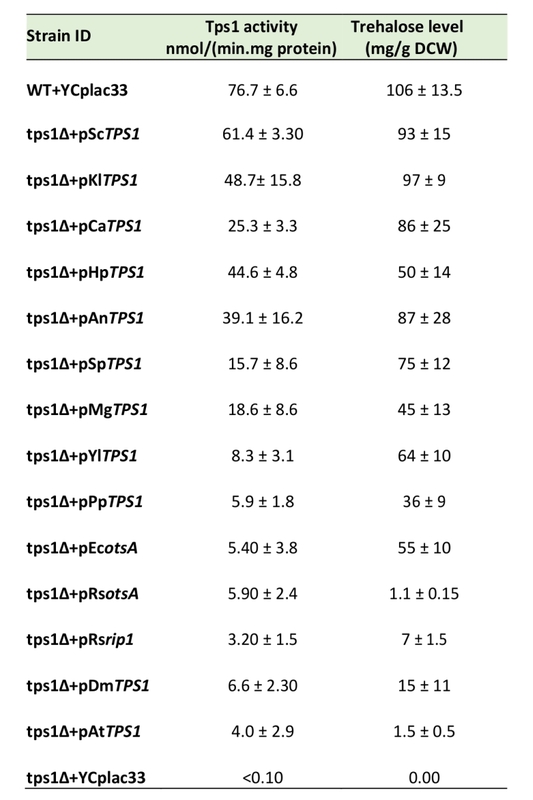 On the other hand, the growth resumption and maximal growth rate of Sctps1Δ on the permissive carbon source galactose was not impacted by the expression of any of the different TPS1 homologues (Table 1 and supplementary data Fig. S4A). As a conclusion, these data indicated that the presence of the Tps1 protein is needed for growth on rapidly assimilated, fermentable sugars, and additionally suggest that the promptness at which the growth can restart on these sugars very likely requires a catalytic active Tps1 protein. TABLE 1. 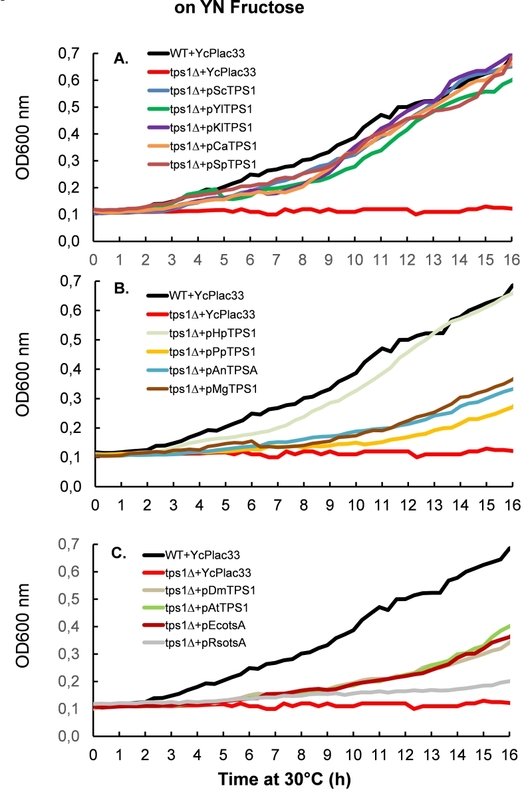 Growth rate of S.cerevisiae tps1 mutant transformed with TPS1 from various origin in microplate on different carbon sources. The yeast strains were cultivated in microtiter plates containing 350 µl of culture media as described in Material and Methods. The microtiter plates were placed in a thermostated Elisa reader (Biotek) set at 30°C under smooth shaking and read every 15 min. NG: no growth. The values are the mean ± standard deviation of three independent biological experiments. FIGURE 3: Resumption of growth of S. cerevisiae tps1 mutant transformed with TPS1 from different organism on YN glucose media in microtiter plate. (A) Complementation of sctps1 with TPS1 homologs from yeast species. (B) Complementation of Sctps1 with TPSD1 homologs from P. pastoris, H. polymorpha and the filamentous fungi A. niger and M. grisea. (C) Complementation of sctps1 with TPS1 homologs from bacteria, plants and drosophila. The experimental design was as in Figure 2 except that the yeast cells were inoculated in 250 µL of YN containing glu-cose at 2% (w/v). Results shown are the mean of two independent experiments. For the sake of clarity, standard devia-tion bars have been withdrawn, but overall the SD was in the range of 10 - 15 %. The disparity in the growth behavior of the Sctps1Δ mutant complemented with TPS1 homologues of different origins while the expression of these genes was apparently correct (see Fig. S3), prompted us to verify whether this phenotypic complementation was accompanied by a measurable Tps1 activity, which would argue that the TPS proteins from these different origins are active in vivo in yeast (Table 2). A first indication that our strategy was valuable was given by the finding that Sctps1Δ transformed with the ScTPS1 gene expressed from a CEN plasmid under the PGK1 promoter regained the activity of Tps1 and levels of trehalose exactly as the wild type (Table 2). We also found that the Tps1 activity and trehalose levels in Sctps1Δ transformed with K. lactis, H. polymorpha, A. nidulans and C. albicans could be grouped together with that of wild type and Sctps1Δ + pScTPS1. With the exception of the AnTPS1, this clustering matched the subgroup 1 of our phylogenetic analysis (Fig. 1). At the opposite, a second group which corresponded to cluster 2 in Fig. 1 was composed of Sctps1Δ transformed with the TPS protein from the bacteria E. coli and R. solanacearum, the insect D. melanogaster and the plant A. thaliana. The activity of Tps1 measured in these transformants was overall ten times lower than that of the wild type. 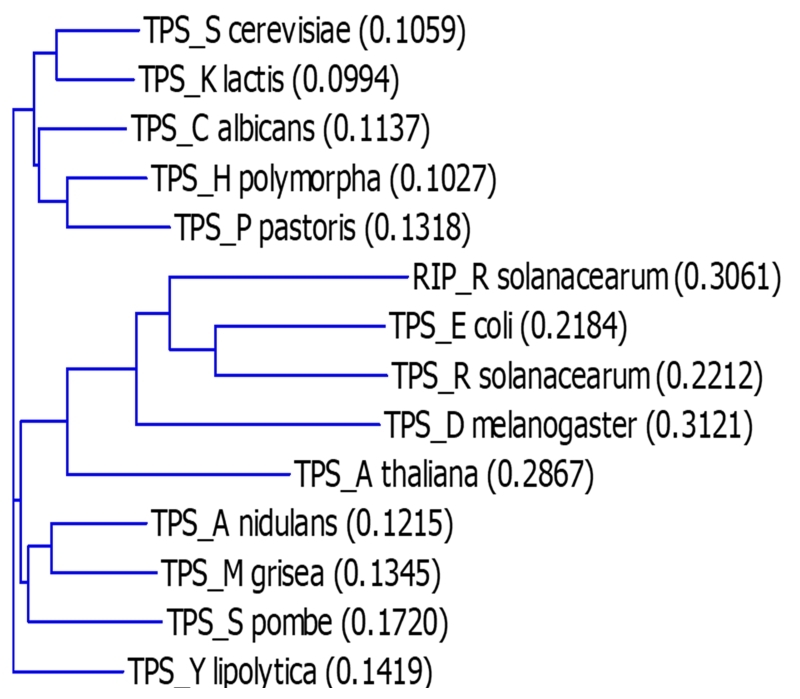 The third group, that also corroborated with the phylogenetic analysis, included TPS1 from S. pombe, Y. lipolytica, and M. grisea, and showed a Tps1 activity that was around five times lower than that of wild type but sufficiently high to accumulate high levels of trehalose. Finally, the Tps1 activity in Sctps1Δ expressing P. pastoris TPS1 was in the same range as that of the bacterial homologous gene (Table 2). When the trehalose content determined in the different strains was plotted as a function of Tps1 activities, a slightly sigmoidal curve was obtained (see supplementary Fig. S5A), allowing to evaluate that optimal synthesis of this disaccharide activity is obtained with an activity of Tps1 in the range of 30 nmol.min-1. mg protein-1. FIGURE 4: Resumption of growth of S. cerevisiae tps1 mutant transformed with TPS1 from different organism on YN fructose media in microtiter plate. (A) Complementa-tion of sctps1 with TPS1 homologs from yeast species. (B) Complementation of Sctps1 with TPSD1 homologs from P. pastoris, H. polymorpha and the filamentous fungi A. niger and M. grisea. (C) Complementation of sctps1 with TPS1 homologs from bacteria, plants and drosophila. The experimental design was as in Fig.2 except that the yeast cells were inoculated in 250 µL of YN containing fructose at 2% (w/v). For the sake of clarity, standard deviation bars have been withdrawn, but overall the SD was in the range of 10 -15 %. TABLE 2. Activity of Trehalose 6-P synthase (Tps1) and levels of trehalose in the S. cerevisiae tps1 mutant transformed by TPS1 of various origins. The activity of T6P synthase was measured at 42°C as described in Material and Methods. Results are the mean ± SD of three independent assays. Trehalose was determined in stationary phase approximatively 12 h after glucose exhaustion from the medium, at a time when trehalose content is about to reach its maximum and stabilizes for several hours before consumption . A well-established metabolic defect harbored by a Sctps1Δ mutant is the huge accumulation of sugar phosphates, the rapid loss of ATP and the absence of T6P production in response to high glucose . We therefore investigated the dynamic response of these metabolites to glucose in Sctps1Δ transformed with the different TPS1 homologues. 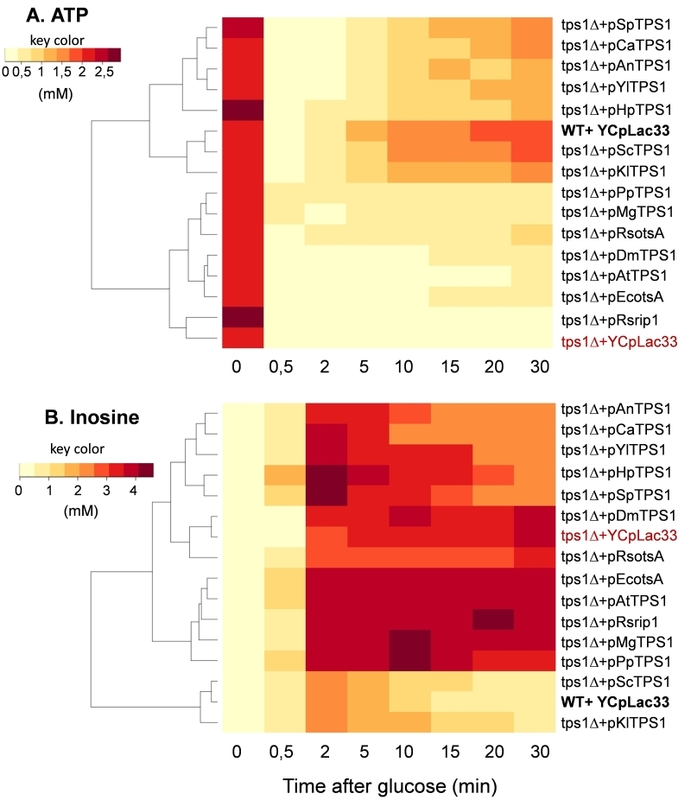 We chose to present the metabolic data as heat map (Fig.5 and 6) since it provides a better visualization of the dynamic changes that occurred in the different strains and shall facilitate grouping of metabolic patterns according to the TPS1 homologue which complements the Sctps1Δ mutant. Note that a classical time course representation of the data is reported in Supplementary Figures S6 to S10. We found, as expected, that the metabolic pattern of Sctps1Δ complemented with its own gene was identical to that of the wild type strain and this pattern was also found with the Sctps1Δ mutant transformed with the K. lactis TPS1, which is in line with the close phylogenetic proximity of these two proteins. At the opposite of this pattern, metabolic profiles of the Sctps1Δ mutant expressing TPS1 from E. coli, R. solanacearum (otsA and rip1), A. thaliana and D. melanogaster grouped together and were remarkably similar to that of the Sctps1Δ mutant. This second group was characterized by a failure to produce T6P (see also supplementary Figure S6) and by an accumulation of H6P (hexose-6-phosphate) and FBP (fructose-1,6-bisphosphate), which were three and then times higher, respectively, than in wild type in response to glucose. In addition, the recovery of ATP, which has been lost after glucose addition, was dramatically impaired in these transformants (Fig. 6 and Supplementary data in Fig. S8). This deficiency in ATP recovery was concomitant with the accumulation of high levels of inosine, which serves as a sink to avoid the cell to lose nucleotide pools . 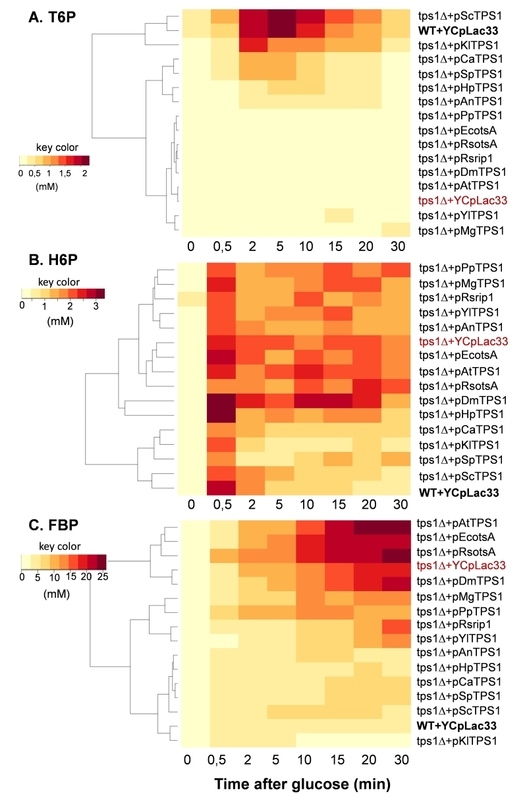 FIGURE 5: Heat map representation of the change in T6P (A), H6P (B) and FBP (C) concentration in S. cerevisiae tps1 mutant expressing TPS1 from different organisms in re-sponse to a glucose pulse. The Sctps1 strain transformed with YCpL33 plasmid bearing TPS1 homologue was cultivated on YN Trehalose 1% till 5 OD600 units. Then, glucose (10 g/L final concentra-tion) was added and samples (5 ml) at different times were rapidly collected by filtration for intracellular metabolite ex-traction and quantification. The data used for the heat map were the mean values of three independent experiments. Abbreviations: H6P mean hexose-6-Phosphate which is the sum of Glc6P and Fru6P; FBP means Fructose 1, 6-bisphosphate. At variance to the phylogenetic analysis reported in Fig. 1, the metabolic patterns exhibited by TPS1 homologues from other yeast species and filamentous fungi were rather dispersed into small subgroups, which can be related to either the wild type (group 1) or to the tps1Δ profile (group 2). More specifically, the Sctps1Δ mutant complemented with TPS1 homologues from C. albicans, S. pombe, and H. polymorpha and to a lesser extent with A. nidulans TPS1 presented a metabolic pattern in response to glucose which was similar to that of group 1. The most notable differences were, nevertheless, an accumulation of T6P, which was four to ten times lower than in wild type, and a slower recovery of ATP following glucose addition. Probably as a consequence of this slower recovery of ATP, these strains were also characterized by a significant accumulation of inosine, which was slowly remobilized afterwards, leading to their clustering with the tps1 strain (group 2) for this specific metabolite (Fig. 5 and 6). On the other hand, the metabolic profile harbored by Sctps1Δ expressing TPS1 from Y. lipolytica, P. pastoris and M. grisea is closer to group 2 than group 1, notably with respect to the very low levels of T6P, high accumulation H6P and FBP as well as inosine, upon glucose addition, and as expected a very slow and delayed recovery of ATP. To conclude, these metabolic analyses provided a clear indication that the TPS protein from these different origins is not equally functional and even if the homologous gene can rescue growth on glucose, this does not necessarily imply the rebuilding of the wild type metabolite profile. FIGURE 6: Heat map representation of the change of ATP (A) and inosine (B) concentration in S. cerevisiae tps1 mutant expressing TPS1 from different or-ganisms in response to a glucose pulse. Same procedure as in Fig. 5. When glucose is added to yeast cultivated on a respiratory carbon source, a rapid metabolic shift to fermentation is taking place. This shift is characterized by the production of ethanol and other fermentable byproducts such as glycerol and acetate. The rate at which these products are formed can be related to the fermentation capacity (see , for a definition). In agreement with its glucose growth defect phenotype, the loss of TPS1 function in the yeast S. cerevisiae almost eliminated the fermentation of glucose into ethanol (Fig.7A). The reintroduction of the wild type TPS1 in the tps1Δ mutant as well as the K. lactis homologous gene fully recovered a wild type fermentation capacity. Also, expression of TPS1 from other yeast species S. pombe, C. albicans, H. polymorpha and Y. lipolytica as well as that of A. nidulans restored the glucose fermentation activity of a Sctps1Δ mutant, but with a 15 to 30% reduced efficiency. By contrast, glucose consumption of the Sctps1Δ mutant expressing the E. coli, R. solanacearum, A. thaliana and D. melanogaster TPS1 homologue was more than five times lower than in a wild type, and lower sugar consumption was accompanied by weaker production of ethanol. This data indicates that these yeast transformants hardly achieved their metabolic shift towards the fermentation. Likewise, but to a lesser extent, the fermentation activity was reduced by 3 to 4-fold in Sctps1Δ cells transformed with TPS1 homologues from P. pastoris and M. grisea. When plotting the fermentation capacity determined in all these yeast strains as a function of T6P measured five min after glucose addition, we obtained a fairly acceptable Michaelis-Menten relationship, allowing to estimate that 50% of the fermentation capacity under these experimental conditions was obtained with about 0.2 mM T6P (Fig. 7B). Likewise, a similar value was obtained by plotting the growth rate on glucose measured in these transformants as a function of T6P (supplementary data, Figure S5B). FIGURE 7: Determination of the fermentation capacity of S. cerevisiae tps1 mutant complemented with TPS1 from different origins. The experimental design was as described in Fig.3 except that the supernatants of the cultures were taken at 5 min interval after glucose addition for 60 min. Exo-metabolites determined by HPLC were expressed as Cmmol consumed (glucose) or produced (ethanol, ace-tate and glycerol) per h-1 and per g DCW-1. Results shown are the mean of three independ-ent experiments with standard deviation bars (A). In (B), Relationship between fermentation capacity (FC) and T6P level. The Origin 2018 software (OriginLab, https://www.originlab.com/) was used to fit the data using the non-iterative fitting algorithm (Levenberg-Marquardt) selecting for the Michaelis-Menten or Hill models defined in the software. It is well known that glucose triggers the transcriptional repression of the gluconeogenic genes FBP1 and PCK1 encoding fructose-1,6-biphosphate and phosphoenolpyruvate carboxykinase, respectively. While this repression requires phosphorylation of the sugar , the intracellular signal is still unknown . Besides the inability of a S. cerevisiae tps1Δ mutant to grow on fermentable sugars, it was recently reported that FBP1 and PCK1 as well as genes of the glyoxylate pathway were not repressed upon glucose addition to this mutant cultivated on a respiratory carbon source . Figure 8 shows a hyperbolic relationship that can be drawn by plotting the repression value for FBP1 and PCK1 genes determined 1 h after glucose addition and the concentration of T6P measured 5 min after the glucose pulse. Therefore, in addition to confirm the finding of these authors, we furthermore showed that the magnitude of the repression of these gluconeogenic genes is very likely dependent on the production of T6P. Interestingly, the T6P concentration that corresponded to half of the calculated maximal fold repression of FBP1 and PCK1 was in the range of 0.2 – 0.35 mM, which is in the same range of the value found for 50% of the maximal fermentation capacity (Fig. 7). FIGURE 8: Expression level of FBP1 (A) and PCK1 (B) in S. cerevisiae tps1 mutant complemented with TPS1 from different organisms. The Sctps1 strains transformed with YCpL33 plasmid and with TPS1 homologues were cultivated on YN containing etha-nol 2% until 5 units OD600. At this time, glucose (10 g/L final) was added and samples (15 OD units) were taken before and 1 h after glucose addition. 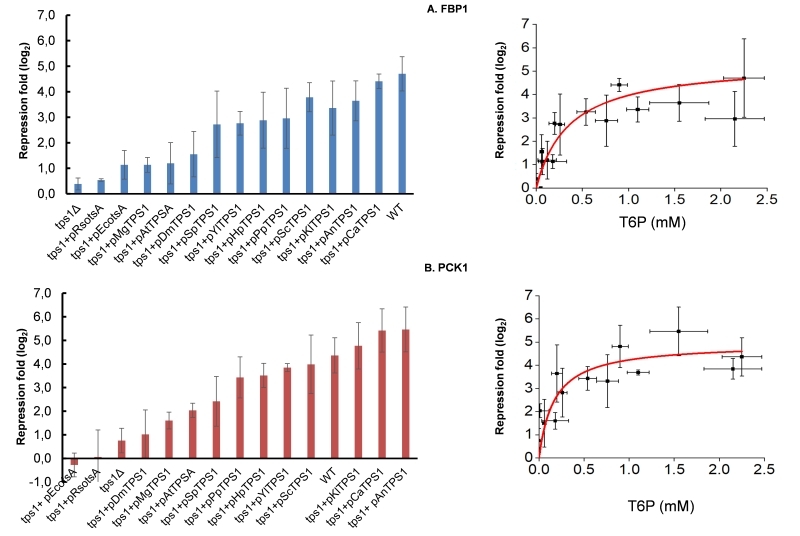 The transcript levels of FBP1 and PCK1 was quantified by RT-qPCR using TAF10 and KRE11 as reference genes for normalization. Results shown are the mean of two. In this work, we revisited the capability of the S. cerevisiae TPS1 homologous genes from different origins to complement the metabolic defects of a Sctps1Δ mutant strain. To realize this comparison in a quantitative manner, we selected TPS1 homologues harboring sufficient phylogenetic distances, and we cloned them into the centromeric plasmid YCpLac33 under the yeast PGK1 promoter. A first interesting result from this physiological analysis was to find that even in the absence of detectable T6P, the growth rescue of tps1Δ on fermentable sugars was observed. This was demonstrated with Sctps1Δ transformed with TPS1 homologues from bacteria, plant or insect that complemented the glucose-negative defect, albeit levels of T6P in these strains after glucose pulse was below our limit of detection. Should this observation mean that the TPS protein alone is sufficient to restore growth of Sctps1Δ on these sugars? We actually propose that a TPS protein that bears intact binding sites for G6P and UDPGlc is absolutely required for yeast to grow on a fermentable sugar, whereas T6P, the product of the reaction catalyzed by this protein, critically promotes sugar fermentation. This proposition is supported by the following data. Firstly, Delorge et al. reported that TPS genes from class II from the plant A. thaliana were unable to complement the glucose-negative phenotype of Sctps1Δ. They ascribed this failure to the lack of these enzymes to have catalytic activity due to the absence of the conserved binding sites for G6P and UDP-Glc in their amino acids sequence . Also, Poueymiro et al. showed that the catalytic inactive variant of R. solanacearum ripTPSY154V (i.e the replacement of Y at position 154 by V abolishes binding of G6P) has lost its ability to complement a S. cerevisiae tps1Δtps2Δ mutant strain on glucose and fructose. Consistent with this result, we found that the growth defect of Sctps1Δ on glucose was not alleviated by the expression of a catalytically-dead Tps1 from the yeast S. cerevisiae (tps1-156 variant that expresses a variant Tps1 in which the G6P binding is abolished by the replacement of Y at position 156 by V; ). Secondly, it was reported that the growth recovery on glucose of the double tps1Δtps2Δ mutant strain was more effective than the single tps1Δ mutant upon the expression of the A. thaliana TPS2 or TPS4 gene, which belong to the class I TPS-like proteins . A similar finding was shown for the R. solanacerum rip1 gene, which better complemented the glucose negative phenotype of a double tps1Δtps2Δ mutant than the single tps1Δ mutant . It was therefore suggested that the better growth recovery of a tps1Δtps2Δ mutant strain expressing these TPS homologs was due to the fact that they could accumulate even very low T6P levels in response to glucose, which was not the case for the single Sctps1Δ strain . From these reports, and with assumption that TPS proteins from these various species are expressed at the same level as that of the wild type yeast, an intriguing question is why they display so significant differences in their catalytic activity. In the case of Tps1 from A. thaliana encoded by AtTPS1, it was shown that the truncation of its extra N-terminal extension, which is not present in the yeast protein, results in a ten to 40-fold increase of its in vitro activity . The TPS protein of R. solanacearum encoded by rip1 also harbours an N-terminal extension, whose deletion might result in a similar effect. On the other hand, Tps1 from P. pastoris, A. thaliana and D. melanogaster show a long C-terminal extension which does not exist in any other TPS proteins. The impact of this C-extension on Tps1 activity has not been examined so far. Besides, taking into account that in vivo S. cerevisiae Tps1 is present in a complex with three others proteins, namely Tps2, Tps3 and Tsl1 , and that the optimal activity of Tps1 likely depends on the interaction with these partners , the very low activity of Tps1 from bacteria, plant and insects expressed in yeast might be explained by a failure to properly form this TPS complex. As a conclusion, a more precise structure-function analysis of the yeast Tps1 is awaiting to strengthen our hypothesis of a possible separated function of this protein in growth on fermentable sugar and in purely synthesis of T6P. The finding that T6P promotes growth resumption on fermentable sugars coincided with the prompt recovery of ATP after its rapid fall following a glucose pulse. The reported inhibition of the major hexose phosphorylating enzyme encoded by HXK2  could be invoked to account for this effect, because this inhibition would restrict the rate of the upper part of glycolysis which consumes ATP, allowing the lower part of the pathway to regenerate it. However, taken into consideration the inhibition constant of hexokinase II for T6P (i.e. 0.05 to 0.1 mM ), and the assumption that the intracellular glucose concentration is within 0.5 to 2 mM in yeast cells challenged with glucose , the hexokinase activity would be maintained inhibited by more than 50% over more than 30 min after the glucose pulse, which would likely penalize the fast resumption of growth and the attendant fermentation activity. On the other hand, the probable absence of this inhibition in Sctps1Δ cells expressing S. pombe, Y. lipolityca or A. nidulans TPS1 homologues due to their low level of T6P is inconsistent with the fact that the fermentation activity of these yeast strains was only 20 to 30% lower than that of a wild type strain. As a consequence, and in the light of previous work showing that manipulating the intracellular T6P content up or down has only little impact on the glucose influx into glycolysis , one must invoke a complementary mechanism by which T6P promotes rapid growth on fermentable sugars. Interestingly, we found a hyperbolic correlation between fermentation capacity and levels of T6P, which is an indication that this metabolite is indeed a positive effector of fermentation. In addition, this data is consistent with the work of Wu et al. which reported a parallel increase in the rate of glucose consumption, ethanol production and the rise of T6P following the short-term (50 to 300 sec) response of carbon-limited chemostat culture to a glucose pulse. Taken these results together, we postulate that T6P is implicated in the short-term Crabtree effect, which can be defined either by the immediate occurrence of aerobic fermentation in response to an excess of sugar to a sugar-limited yeast culture , or more broadly as the capacity of yeast cells to readily switch from respiration to fermentation in response to glucose . Although the molecular mechanism of this metabolic switch is still a matter of debate, it is clear that this switch is intimately dependent on the rate at which glucose enters the cell . Heineman and colleagues  have introduced the notion of ‘flux-sensing mechanism’ to account for the fact that these metabolic phenotypes are triggered by a rapid change in sugar influx. Furthermore, they argued that these metabolic shifts require the cell to be able to measure “metabolic flux” through the level of some “flux-sensing” metabolites. FBP has been proposed as a possible flux-sensing molecule based on a good, yet strict, linear correlation between its intracellular levels and the sugar uptake rate . In addition, this metabolite has been directly implicated in the Crabtree effect because of its ability to inhibit at physiological concentration (i.e. 2 to 10 mM) the oxidative phosphorylation of isolated mitochondria or permeabilized spheroplasts of yeast . However, this latter data is not consistent with the fact that strains harbouring high levels of FBP such as Sctps1Δ expressing bacteria, plant or insect TPS protein hardly undergo the fermentation shift upon glucose addition. We therefore propose that T6P is a better flux-sensing molecule than FBP because it is metabolically located closer to the glucose uptake than FBP, it interacts at the gate of the glucose entrance through its action on hexokinase and it exhibits a Michaelis-Menten relationship with fermentation activity. The same flux-sensing function of T6P in glucose repression could be also invoked based on the fact that repression of the gluconeogenic genes FBP1 and PCK1 is strictly dependent on T6P. Interestingly, the concentration of T6P that corresponded to 50% of the maximal glucose repression effect is in the same range (i.e. 0.2 – 0.3 mM) as the one estimated to reach 50% of the optimal fermentation activity, which suggests that the molecular targets of this metabolite are the same for these two processes. The proposed role of T6P as a sugar signaling molecule in yeast is convergent with its assigned function in plants as a sensor of sucrose to integrate carbon assimilation with plant growth . This integration is obtained by the inhibition of the SNF1-related protein kinase by T6P. Whether this inhibition is direct or indirect is still unclear but, whatsoever the exact mechanism, this action of T6P overcomes the antagonistic effects of this kinase on the anabolic processes and growth in response to high level of sugars . In yeast, the Snf1 kinase is essential in the derepression of gluconeogenic genes and in respiration . However, contrary to expectation, this kinase is insensitive to T6P . A common trait of yeast mutants harboring negligible levels of T6P upon glucose addition is their very lengthy recuperation of ATP, which could be explained not solely by a lack of hexokinase inhibition but also by the absence of a stimulatory action on downstream metabolic targets. In a previous work, we showed that the purine salvage pathway (PSP) was important in the control of ATP homeostasis under transition from respiration to fermentation and that the rebuilding of ATP shortly after a glucose pulse was largely attributed to the reassimilation of inosine . Therefore, enzymes of the PSP can be potential targets of T6P. It is also conceivable that the failure of glucose repression of FBP1 and PCK1 is a consequence of the very low levels ATP in these strains which harbor low to negligible production of T6P. The Saccharomyces cerevisiae tps1Δ and tps2Δ mutants were derived from the CEN.PK133-5D ura3-52 strain  and have been described elsewhere . 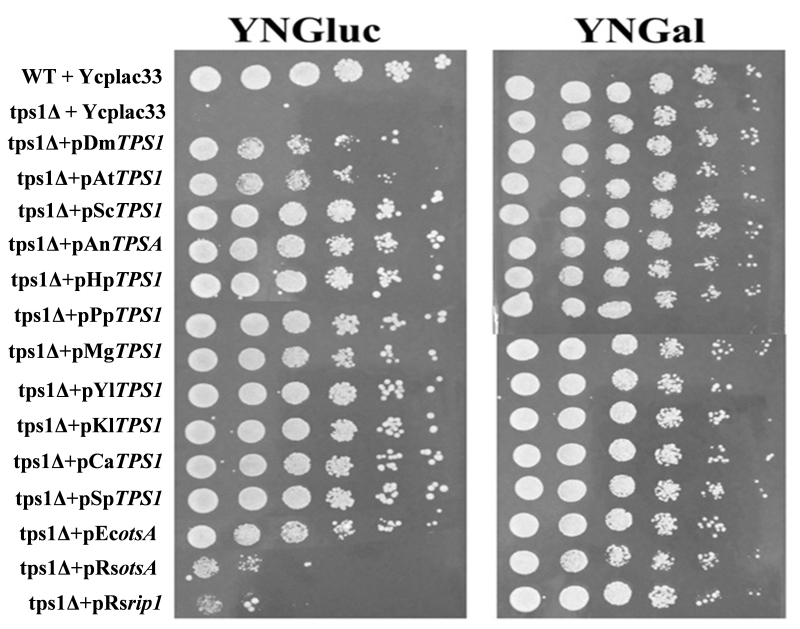 The tps1Δ strain was used as the host for transformation with the YCplac33 plasmid  bearing TPS1 from various origin (Saccharomyces cerevisiae, Drosophila melanogaster, Arabidopsis thaliana, Escherichia coli, Aspergillus nidulans, Hansenula polymorpha, Pichia pastoris, Magnaporthe grisea, Yarrowia lipolytica, Kluyveromyces lactis, Candida albicans, Schizosaccharomyces pombe and Ralstonia solanacearum) under the control of the S. cerevisiae PGK1 promoter. The TPS1 coding sequence from these organisms was amplified by PCR using 5’ and 3’ primers listed in Table S1. The PCR fragments were cloned into the YCplac33 plasmid using the In-Fusion system (Clontech), except the ones from M. grisea and P. pastoris, for which exons were amplified and assembled by using the NEBuilder® HiFi DNA Assembly system (New England Biolabs). 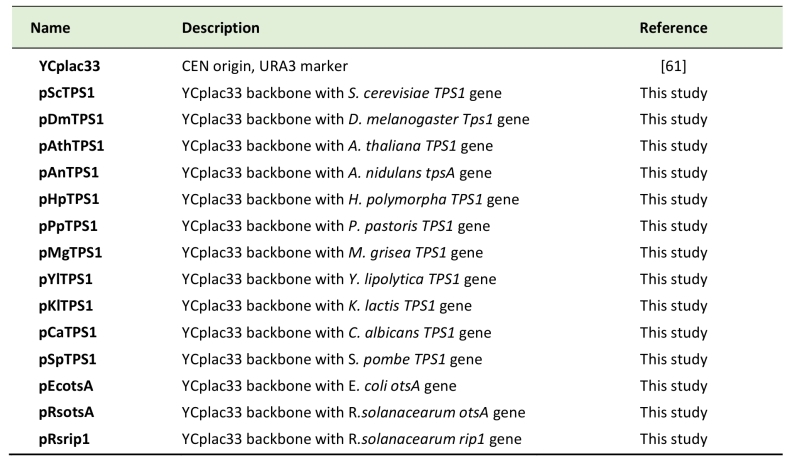 All plasmid constructs bearing the TPS1 homologues are listed in Table 3 and were verified by DNA sequencing. The Lithium acetate procedure described in  was used to transform S. cerevisiae tps1Δ mutant with the different plasmids. TABLE 3. List of plasmids used in this study. Unless otherwise stated, yeast cells were cultivated on a YN synthetic medium (17 g of yeast nitrogen base without amino acids and 5 g of ammonium sulfate per liter) buffered at pH 5.5 with 13.5 g/l succinic acid and 6.5 g/l NaOH, with 2% galactose as carbon source and complemented with 100 mg/l uracil. To verify that the tps1Δ mutant has not undergone phenotypic or genetic ‘reversion’ that allows growth on glucose , we streaked this strain on a YN fructose 2% complemented with uracil. Under this condition, no colonies were seen after at least 5 days of incubation at 30°C, whereas several ‘colonies’ arose after 2 days on YN glucose + uracile agar plates. Unless otherwise stated, growth of the mutant and transformants was carried out in baffled 1 L Erlenmeyer flasks containing 200 ml of culture medium at 30°C on a rotary shaker at 200 rpm. The carbon source (glucose, galactose, raffinose) was added at 2% (w/v) except trehalose which was added at 1% (w/v). Growth on Petri dish plates was carried out in YN synthetic medium containing glucose or galactose at 2% (w/v) and supplemented with agar 2% (w/v). The glucose pulse experiment was performed as described in a previous report . Briefly, the yeast cells were cultivated in YN containing 1% trehalose and buffered to pH 5.5 using 50 mM potassium phthalate instead of Na-Succinate until they reached OD600 5 units (i.e. around 1 g dry mass per liter). Then, they were harvested, washed once with water at room temperature and resuspended in YN medium for 30 min at 30°C. Then, glucose was added to a final concentration of 10 g/l using a concentrated stock solution of 50% (w/v). Samples (5 ml) were harvested at the indicated timepoints in the corresponding figures (Fig 4 to 6) by rapid filtration on 0.45 μm porosity nitrocellulose filter and immediately quenched in 3 -5 ml of 75% hot ethanol, followed by 4 min of incubation in a water bath set at 80°C according to . After extraction, removal of ethanol by evaporation and resuspension of the dry pellet in 0.5 ml of sterile water, the metabolites were quantified in an ICS-3000 system equipped with an automatic eluent (KOH) generator system (RFIC, Dionex), an autosampler (AS50, Dionex), a photo diode array detector (Ultimate 3000, Dionex), a conductivity detector (part of ICS-3000, Dionex) and a mass-sensitive detector (MSQ Plus, Thermo Scientific) running in ESI mode (nitrogen pressure was 90 psi (1 psi=6.9 kPa), capillary voltage was 3.5 kV and probe temperature was 450◦C), according to . The concentration of intracellular metabolites is expressed in mM taking into account the assumption that 1 g of dry cell wall contains 2 ml of cell sap . Quantification of TPS1, URA3 FBP1 and PCK1 transcripts was performed from two independent biological cultures. Yeast cells (about 15 OD600 units) were collected by centrifugation (3000 rpm, 4°C, 2 min), followed by a washing step with 1 ml of sterilized water. The cell pellets were immediately frozen in liquid nitrogen and stored at – 80°C. Cell disruption was performed with a Tissue Lyser system (Qiagen) at 30 Hz during 3 minutes. Total RNA was isolated according to RNeasy Total RNA Isolation Kit Manual (Qiagen) and concentrations of RNA samples were calculated by using NanoDrop 2000 UV-Vis spectrophotometer (Thermo Scientific, USA). Quality assessment of RNA samples was performed by Agilent RNA 6000 Nano kit and 2100 Bioanalyzer (Agilent Technologies, USA). Complementary DNA was synthetized with 1 μg of total RNA using the iScript cDNA Synthesis Kit (Bio-Rad). The absence of genomic DNA in RNA samples was checked by qPCR before cDNA synthesis (minus RT control). A blank (No Template Control) was also incorporated in each assay. The Quantitative PCR (qPCR) was performed using the Sso Advanced Universal SYBR Green system (Bio-Rad), 4 μl of cDNA 10 times diluted and 2 μl of primers (2 mM). The PCR program comprised an initial denaturation step of 1 minute at 95°C and amplification by 40 cycles of 10 sec at 95°C, 45 sec at 54°C in a Bio-Rad MyIQ cycler. The TAF10 and KRE11 genes were used as reference genes for normalization, following the recommendation of Teste et al. for accurate transcripts measurement. Primer sequences used for RT- qPCR are provided in Table S2. The activity of TPS was determined in cell crude extracts according to the procedure described in . Briefly, yeast cells (about 10 mg dry mass or 50 OD600 units) were collected by centrifugation (3 min at 2000g, 4°C) and washed with cold sterile water. Crude extract was performed by breaking yeast cells in 0.5 ml extraction buffer (20 mM Hepes, pH 7.1 containing 1 mM EDTA, 100 mM KCl, 1mM DTT, and 1mM PMSF) with 0.5 g glass beads (0.5 mm diameter; BioSpec 11079105) on a vortex set at full speed. The vortexing was done 6 times for 30 sec with 30 sec intervals where tubes were kept on ice. The assay was realized at 42°C in the presence of 10 mM Glucose-6-P/3 mM Fructose-6-P and 5 mM UDP-glucose in 20 mM Hepes buffer, pH 7.1, 5 mM MgCl2, 1 mM EDTA, 100 mM KCl. The reaction was stopped by heat (5 min at 80°C). The Tps1 activity was determined either by the amount of UDP released or by the amount of trehalose-6-phosphate (T6P) produced and determined as intracellular metabolites by LC-MS as described above. Proteins were quantified with the Bradford reagent (Bio-Rad protein assay dye reagent concentrate, 500-0006). Glucose, ethanol, acetate and glycerol were determined in the medium supernatant by withdrawing 1 ml from the YN glucose cultures at the desired times. Samples were centrifuged at 13,000 rpm for 5 min in a bench-top centrifuge (Eppendorf 5415D), supernatants were filtered through a 0.45 μm syringe filter, and stored at -20 °C until further analysis. Quantification was carried out using High performance liquid chromatography (HPLC) on an Ultimate 3000 system (Dionex, Sunnyvale, USA). The HPLC system was equipped with a cation-exchange column (Aminex HPX-87H – 300 x 7.8 mm, 9 μm, Biorad), an autosampler (WPS-3000RS, Dionex), a RI detector (RID 10A, Shimadzu), and an UV/VIS detector (SPD-20A, Shimadzu). The mobile phase was 1.25 mM H2SO4 at a flow rate of 0.5 ml/min. Column temperature was held at 35°C. Glycogen and trehalose content were measured by glucose colorimetric assay after Na2C03 treatment of the whole cell as described by . M. Walker, " Yeast physiology and Biotechnology. ", Wiley & Sons, West Sussex, England., 1998. We thank colleagues of the JMF laboratory for critical discussions during this work and Dr Marion Schiavone for helping us with the Origin 2018 algorithm for fitting the kinetics data. This work was sup-ported in part by ANR Blanc n°07-2-200101 and by Region Midi Pyrénées (France), grant N° 09003813 to JMF. JLP is researcher at the Centre National de la Recherche Scientifique (CNRS), RLV was a fellow of the Fundacion Alfonso Martín Escudero and J.P.G.L is a postdoctoral fellow financially supported by Toulouse Region Midi Pyrenées. Trehalose-6-phosphate promotes fermentation and glucose repression in Saccharomyces cerevisiae by Vicente et al. is licensed under a Creative Commons Attribution 4.0 International License.